This one-pot Chicken and Bacon Dumpling Stew is a heartier take on chicken and dumplings, and it’s perfect comfort food for cooler temperatures! Packed with chicken, veggies, and bacon and topped with big, fluffy, easy-to-make dumplings, this is a filling meal that will warm you up from the inside out. Plus it’s all made in one pot for less clean up and a serving is just 281 calories or 4 WW (formerly Weight Watchers) Freestyle SmartPoints! I do have another recipe on my site for Herbed Chicken and Dumplings (also a one pot meal!) with dumplings made from scratch which is “soupier” than this Chicken and Bacon Dumpling Stew. Both are delicious but totally different in flavor and texture, so feel free to look at both and decide which one strikes your fancy. 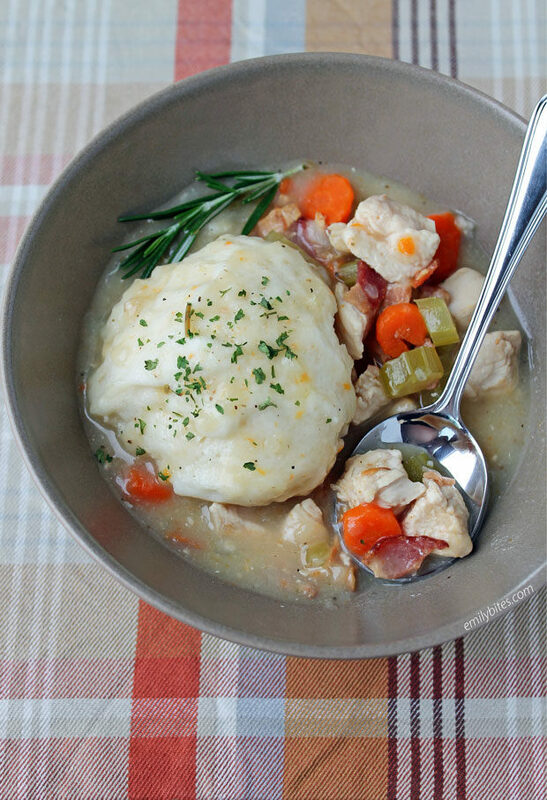 Looking for more lightened up one-pot meals like this Chicken and Bacon Dumpling Stew? Check out my Chicken Pot Pasta, Spanish Chicken and Rice Skillet, Turkey Sloppy Joe Pasta, Beef Enchilada Pasta Skillet, White Chicken Chili, Mexican Chicken Cauliflower Rice Skillet, Thai Turkey with Carrot Noodles, Lemon Chicken Orzo with Tomatoes and Asparagus, Rustic Sausage and Potato Skillet, Beefy American Goulash, Beef Stroganoff, One Pot Cincinnati Chili Spaghetti Bake, Pumpkin Alfredo Tortellini Skillet, Cheesy Chicken Veggie Pasta Skillet, The Best Turkey Chili, Sausage Tortellini Skillet and more in the One-Pot Meal section of my recipe index! Place the chopped bacon in a dutch oven and bring over medium heat. Cook until crisp and then remove to a stack of paper towels with a slotted spoon. Reserve 2 teaspoons of bacon grease in the pot and discard the rest. Bring the pot to medium-high heat and add the chopped chicken. Stir to coat in the bacon drippings and cook, stirring occasionally, until the chicken is lightly browned. Add the carrots, onions, celery, bay leaf, rosemary, chicken broth and 2 cups of the water and stir to combine. Bring to a boil and then cover and reduce the heat to a simmer. Simmer for 20-30 minutes until the vegetables are tender, but not mushy. Remove the bay leaf. In a small bowl, mix together the remaining ¼ cup of water and the flour until fully combined into a slurry. Add to the stew and stir to combine. Bring the stew to a boil and cook and stir for about 2 minutes to thicken. Add the salt, pepper and bacon to the pot, stir to combine and then reduce heat to simmer uncovered. In a mixing bowl, combine the Bisquick and milk and stir to form a dough. Split the dough into six mounds and drop them onto the surface of the simmering stew. Cover the pot and cook for another 15 minutes until a toothpick stuck into the dumplings comes out clean. Taste the stew and add any additional salt and/or black pepper to taste. What if I don’t use Bisquick Heart Smart baking mix and use regular Bisquick? It’s hard to find. Will recipe come out the same ?